To Have and To Hold Wedding Stationery offers a range of beautifully handcrafted wedding invitations and wedding stationery. Each item is carefully handmade using high quality materials. We offer everything you will need before, after and on the big day, from Pocketfold invitations to Thank you Cards. Our stylish and unique designs can be personalised to your requirements, which means you can incorporate your chosen colour theme into your wedding stationery to make it unique to you. All of our items are available in a variety of formats, sizes and colours. We offer co-ordinating items to match the design of your chosen invitations so your theme can continue throughout the day, making your wedding day extra special! We can provide samples of any of these items for you to view in your chosen design and colours prior to placing an order. If you would prefer something completely different, we also offer a bespoke service for uniquely designed wedding stationery at no extra cost. We are based in Newport, South Wales, but we cover the whole of the UK. 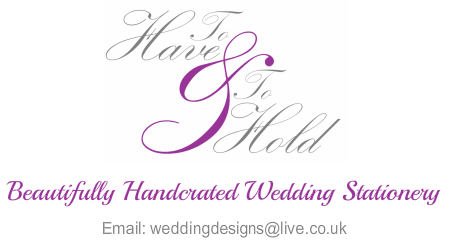 Please email us at weddingdesigns@live.co.uk to discuss your wedding stationery requirements.